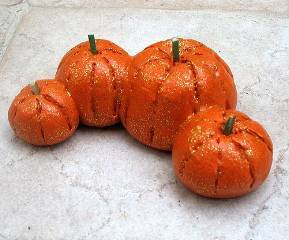 Mix up an easy batch of salt dough and make yourself a patch of bright, sparkling pumpkins for Halloween. Salt dough is a great medium for fun and creative crafting. Take this sparkly pumpkin patch for instance! Salt dough recipes aren’t just for kids. Make these fun and festive pumpkins this Fall for your holiday decorating. Roll dough in your hands to form different sized balls. Line them up on a cookie sheet, touching each other so that they will be one piece after baking. Use a toothpick to draw lines on the pumpkins. Insert toothpick halves, point size down, into the top center of the pumpkin to create the stem. Be sure to do this step BEFORE baking. Bake for approximately 2 – 2.5 hours. Remove from oven and allow to cool completely. For best results, allow to cool and dry overnight, or for at least 4 hours. Paint pumpkins with two coats of orange paint, allowing to dry in between coats. When dry, paint with a coat of gold glitter paint or glitter glue. Let dry. Amanda Formaro is the entrepreneurial mother of four children. She is also the Chief Editor and Craft Expert of FamilyCorner.com Magazine.